Perfectly practical and strikingly stylish, the Kip 3 Seater Sofa Bed is the must have for every modern home. Doubling as both a lounge and extra bed, the piece is space saving while bringing a touch of contemporary elegance to an interior. The Kip has subtle designer details that make it stand out from the rest, including soft rounded armrests and matching button detailing. The simple silhouette and natural wood legs are both modern and timeless. Select from four premium neutral shades including Ecru, Biscuit Beige, Storm Grey and Dark Gull Grey, designed to match any interior. 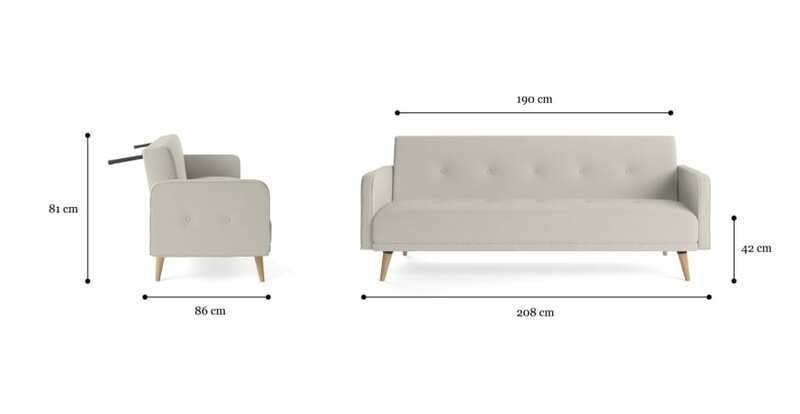 Shop more sofa beds available from Brosa in a range of styles. The highest quality materials and craftsmanship have gone into the construction of the Kip 3 Seater Sofa Bed, ensuring you have a piece that will last. A generous foam filling makes the piece as comfortable as possible! Are the legs hidden when this is used as a sofa? See, touch and feel our fabrics used on our Kip 3 Seater Sofa Bed. For Free! Simply select up to 3 fabrics and add them to your cart. Delivery is on us.